The LCD and plasma stands are a great way to showcase flat screen televisions or monitors for your trade show display, office, showroom, lobby or home. 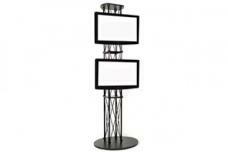 Trade Show Emporium’s LCD and plasma television stands are designed to give your area with an open feel. The slim design allows you to place these stands in corners, against walls or out in the open. Functional cable management helps any television stand maintain a sleek, organized look. LCD and plasma stands come in a variety of configurations that allow you add shelves or adjust the screen’s height. 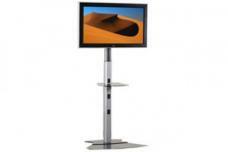 LCD and plasma screen television stands from Trade Show Emporium are the ideal stands for your flat screen television. Place these stands anywhere including your trade show display, home, office, lobby or showroom. Internal cable and management pathways help hide any cords or cables. Optional shelves allow you to add a DVD player, keyboard or display literature. The Apollo and Genesis models both feature adjustable monitors that can reach over 85 inches in height, while the Viking and Voyager are fixed at 61 inches. All models incorporate the ability to tilt the screen, which help optimize ideal viewing angles. The Viking and Voyager have angles of -2°, 0° and +5°, while the Apollo and Genesis can be angled between +/- 15°.